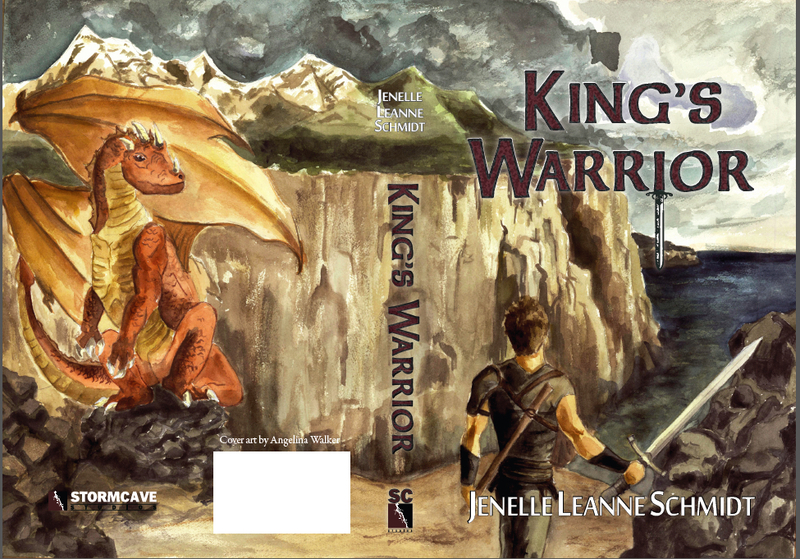 Thought you might all enjoy a sneak peek at the finished cover of King’s Warrior. Excuse me if I sound a little hyper or excited, but I have come to the culmination of two years of very hard work. It has been fun, and it has been gratifying, and it has been satisfying work, but that does not mean it has not been hard, that there have not been tears, that there have not been set-backs. Last night we had a major set-back, when we realized that the font we had picked for the title was one that was only available for private use, and that buying a commercial license was going to cost one hundred fifty dollars! Needless to say, I cried. (And I felt bad, because Angelina had worked so hard and we thought we were almost finished, only to find out we had to find a completely new font). However, Angelina is a miracle worker, and she spent the next two hours working on a new version, and I must say, I love this one as much as I loved the original. Derek says he likes it more, because the old font was (we did not do this intentionally) based on the logo for the Lord of the Rings movies! Anyway, after all that, the cover was finally complete! I got it submitted last night, and within the next 36 hours I should get the go-ahead to order a proof copy, which means that sometime early next week, I will have physically in my hands the result of all this work we’ve been pouring out over the past year! But, of course, the part of this post you’re really interested in: what does the new cover look like? Here ya go! Isn’t it just beautiful? If you click on it, you can see it larger. The interior layout for King’s Warrior is finished and submitted!!!! Happy dancing ensues. This is the culmination of nearly two year’s worth of re-writing and editing that this book, originally titled The Dragon’s Eye, has undergone. The re-write started in March of ’09 because 1) I got a lot of helpful feedback from other writer’s in the Amazon Breakthrough Novel Award contest and 2) I had finally finished the 4th book in the series and realized that my writing style had improved immensely in 8 years, and that my first book was not at all up to the standard of the conclusion of the series. All that is left is to get the final cover and upload it to CreateSpace, and 5 days from then I will have the proof copy IN HAND! How exciting!!! Yes, I’m overusing exclamation points, it’s ok, I mean them. I know she’s going to be somewhat embarrassed (and not altogether unpleased) that I included her here, but considering that my mom is the one who taught me how to read and write in the first place, I thought it was important to feature her here in my Tuesday Team member posts. And, coincidentally enough… today’s post falls on her birthday. (I really didn’t realize until I finished writing and got to the scheduling part of this post that it would post on her birthday, but I think it’s cool). However, despite having to raise me through my more trying years, she has always believed in me and encouraged me to do my best. Nothing less than my best was good enough, and I’m so thankful she and my dad never let me settle for mediocrity. I know that the genre I write is not her favorite to read, but she reads them anyway, and tells me she loves them. She gets excited about my books when they are “finished” and in “real book” (i.e. bound) format. Her enthusiasm for my writing, even when it’s not the sort of thing she would voluntarily pick up and read if I hadn’t written it, means the world to me, and speaks her love in volumes. Nothing new to report on the book front today… I am hoping that soon I will have an announcement about the book going to the printer for a proof-copy! And maybe I’ll post a preview of the new cover soon, would you like that? Or would you rather I wait until the book is available for purchase? Anyway, I’ve been getting some pretty regular visitors to this blog, and analytics is showing that some of you are reading this from rather afar: Turkey, Australia, Brazil… all over the world – which is cool. So I’m just curious: would you leave me a comment and tell me where you’re reading from? I think it would be interesting to know! I don’t know if I’ll have a Featured Artist Friday this week… but I have my Meet the Team Tuesday post for next Tuesday all scheduled and ready to go!